The free guide is now available, and is packed with information and images. Find out more. The Stoneham War Shrine was erected in 1918 to commemorate those who served and died in the Great War of 1914-1919. It was restored in 2011 to honour all those who place their lives in danger through service to their country. The remarkable WW1 War Shrine at North Stoneham, near Eastleigh in Hampshire is currently being returned to its original condition. The wider project is furthering the conservation of the historic parkland where the monument stands, and using the Shrine as a key to unlocking the history of the local landscape - through a series of public events, talks & walks, activities for schools, an exhibition, and publication. There are also many volunteering opportunities, including outdoor conservation tasks. The Shrine was built in 1917 by landowner John Willis Fleming as a war memorial to his son Richard and the other thirty-six men of North Stoneham parish who died in the Great War. The Shrine was sited on Cricketers Hill in historic North Stoneham Park, a 1000-acre parkland designed by 'Capability' Brown in the eighteenth century. The Shrine is one of an identical pair, the other at Havenstreet on the Isle of Wight was restored in the 1960s. The programme began with an Act of Remembrance at the Shrine in November 2008, coinciding with the 90th anniversary of the Armistice. 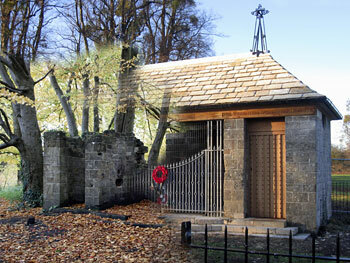 The Restoration of the Stoneham War Shrine is a joint initiative between Eastleigh Borough Council and The Willis Fleming Historical Trust, and is supported by Hampshire County Council and The Hampshire Gardens Trust. It is made possible thanks to a £50,000 grant from the Heritage Lottery Fund. The restoration is also supported by a grant from the Grants for War Memorials scheme, funded by English Heritage and The Wolfson Foundation. The restoration is taking place as two projects. The first will make the structure secure, by restoring the masonry and creating a new oak roof frame with a temporary protective covering, and is expected to be completed by July 2010. The second phase will complete the restoration, and include all the fixtures and fittings and ornamental ironwork. The Shrine is located in 13-acre Avenue Park, a public park belonging to Eastleigh Borough Council, whose Countryside Service manages in excess of 300 hectares across the Borough. The Willis Fleming Historical Trust conserves and celebrates the heritage of the Willis Fleming family of Stoneham and Bletchley, and draws on this heritage to explore wider cultural themes. If you have any information connected with the War Shrine, North Stoneham Park, and the Estate - memories, stories, photographs - please contact Harry Willis Fleming. Copyright © 2008-2011 Project Steering Group / Trustees of the Willis Fleming Historical Trust. All rights reserved. Sitemap.